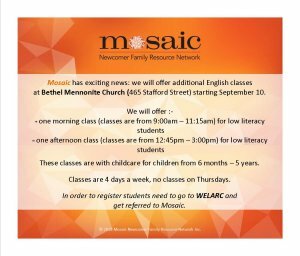 Mosaic has exciting news: we will offer additional English classes at Bethel Mennonite Church (465 Stafford Street) starting September 10. These classes are with childcare for children from 6 months – 5 years. Classes are 4 days a week, no classes on Thursdays. In order to register students need to go to WELARC and get referred to Mosaic.